The Olympic Torch visited Solihull on July 1st 2012. We positioned ourselves on the railway bridge in Streetsbrook Road and recorded the moment in a few photos and videos. The torch convoy entered Solihull after traveling along the A34 Stratford Road from Victoria Square in Birmingham to Robin Hood Island. It then went along Solihull Lane and into Streetsbrook Road. It reached us on the bridge at about 7:45. Then more sponsors had their busloads. It’s evident that those on COKE float had been drinking too much Coke, and the Lloyds bus looks very funky. Does anyone who has been on our Historic Bus Tours recognise the excited lady with the union flag at the end? See the second video by clicking HERE. Streetsbrook Road bridge was one of the relay changeover points. Here the next torch bearer is waiting for the changeover. His name is Robert Ireland and here is his story: In ’72 Rob went to Munich Olympics with GB P.E. Student Party. Retiring 40 years on, it would be fitting for him to bear the torch after a life of service to sport & teaching. PE teacher; school tennis and county hockey coach; club hockey player; basketball and athletics committee member; President of Solihull Schools Sports Federation after 30 years as a member, his is a CV of humble grassroots service which many feel deserves recognition. 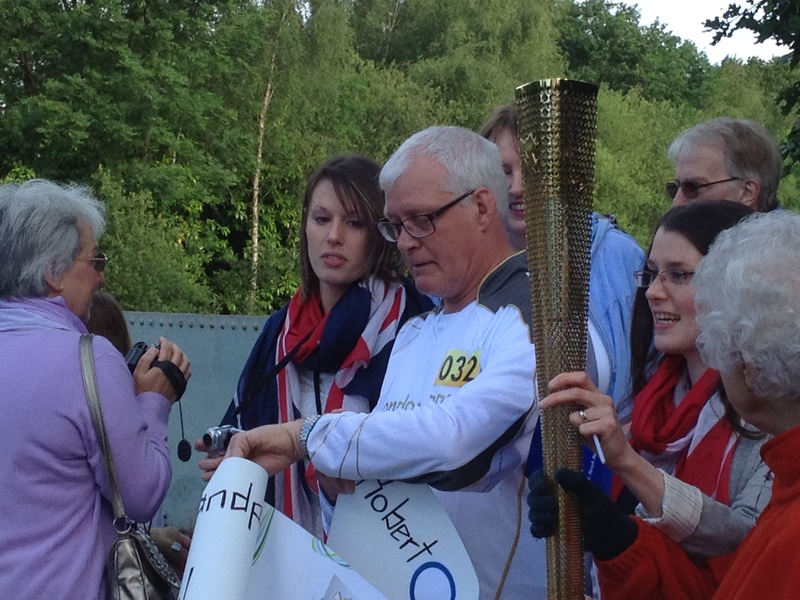 Robert Ireland waiting on Streetsbrook Road Bridge, Solihull for the next torch bearer Tommy Godwin. Finally here’s another video this time of the flame bearer Tommy Godwin (who is 91 years old!) 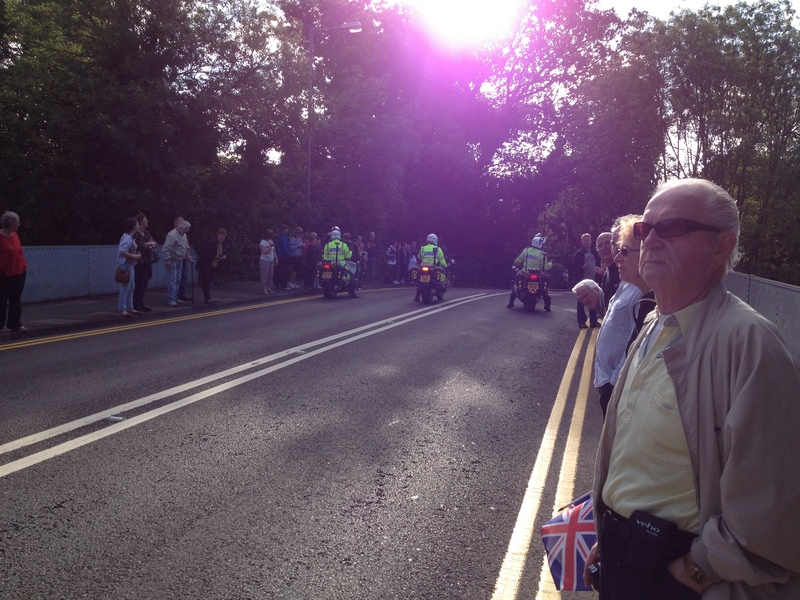 arriving for the torch changeover at Streetsbrook Road bridge. Tommy is a local sporting hero, and here’s his story: Tommy is a living legend. Winner of two bronze medals for cycling at the 1948 London Olympics, at the age of 90 he remains fit and sharp. He has been an ambassador of cycling in his home town of Birmingham for 60 years and, for a period, managed the GB team. Listing his achievements would take far too long, but he has inspired the young with his regular talks in schools, taking his many medals to show. Track cycling in the UK would not be in the healthy position it’s now in if it wasn’t for Tommy’s legacy and inspiration. He truly deserves the honour of carrying the Olympic flame. Instead of watching the Olympics we are going to be planning our Historic Bus Tours for 2013. We’ve got a few ideas in mind so keep coming back to www.outercirclebus.com to see what we are going to be doing.